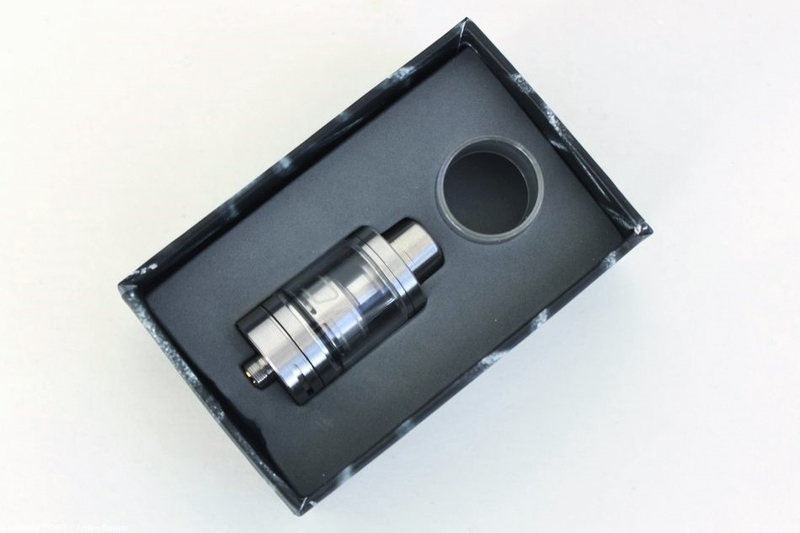 With the strong success of its Serpent Mini, Wotofo unveiled their new masterpiece, Conqueror Mini RTA, a reconstructible atomizer in dual coil mounted on a postless base. With its 39 mm high (10 more than the Serpent Mini) for 22 mm in diameter, the Conqueror Mini is compact with a capacity of 2.5 ml only. It comes in a box with two user manuals. 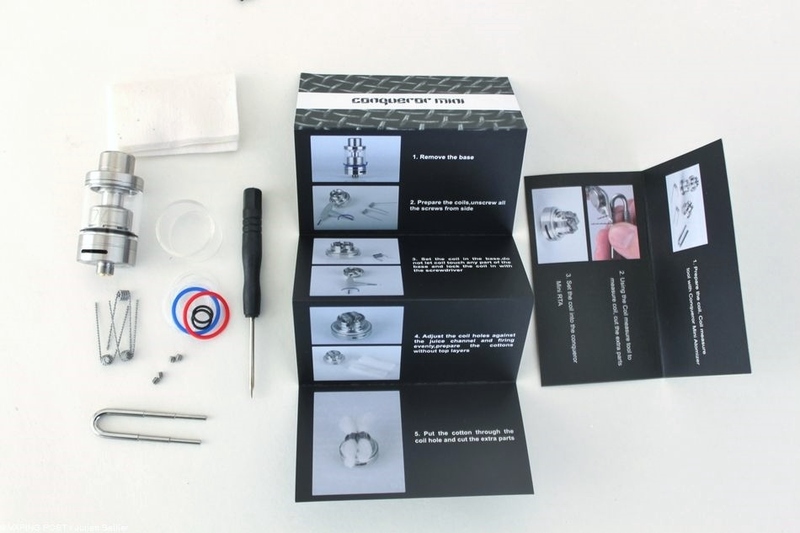 Also included in the packaging, a spare Pyrex tank, a tool to install the coil on the base, many O-rings and screws, a screwdriver and three pre-built coils (Kanthal). 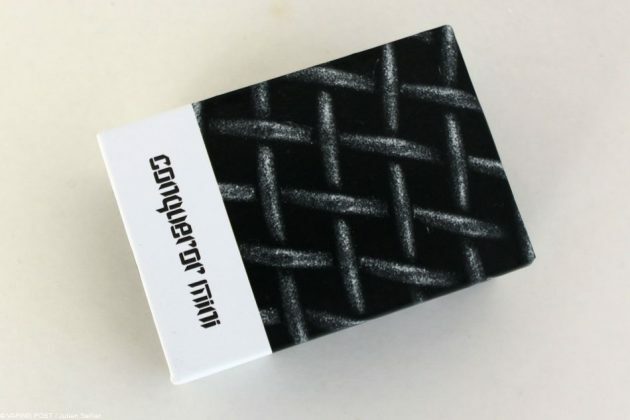 The signature of the Conqueror Mini is its postless-type deck. 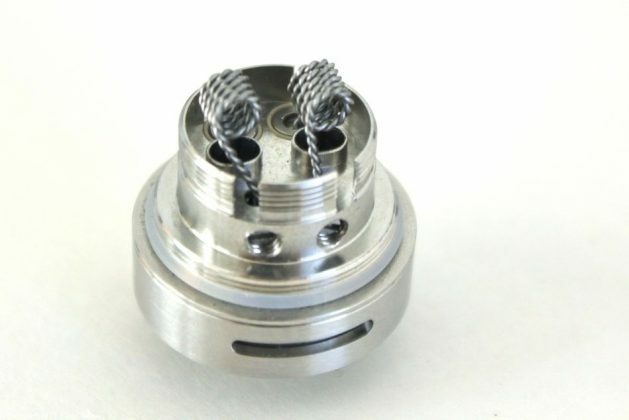 The legs of the coils are inserted into the base, which requires to cut them at the right size to place the coil above the airflow hole. The operation is made simple thanks to the installation tool. Finally, the last operation consists in tightening the legs with the four screws located on each sides. 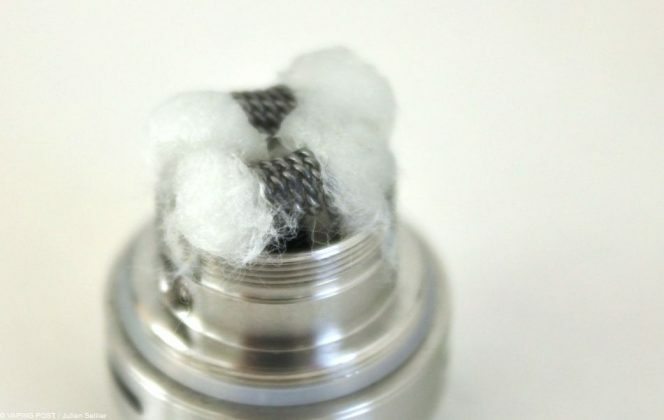 Take care to place the coils so that the wicks dip into the liquid inlets. 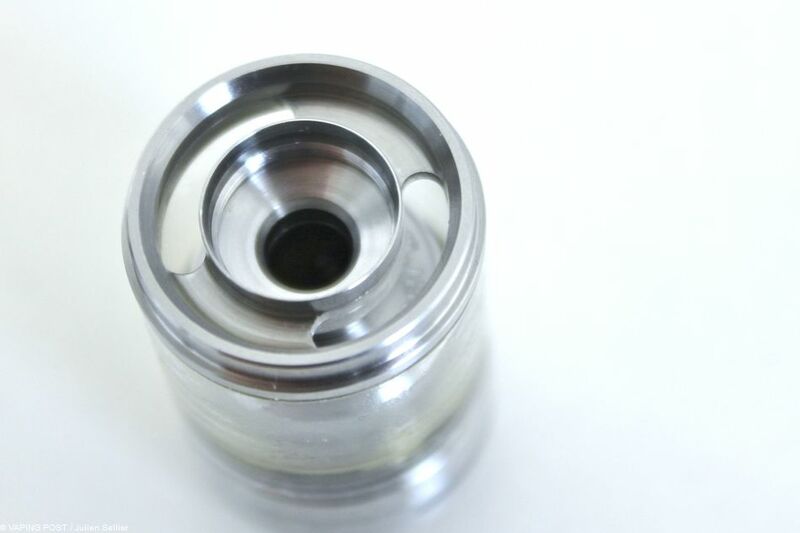 To avoid any leakage, the wick must completely fill the liquid inlets to force the e-liquid inside the wick and not around it. 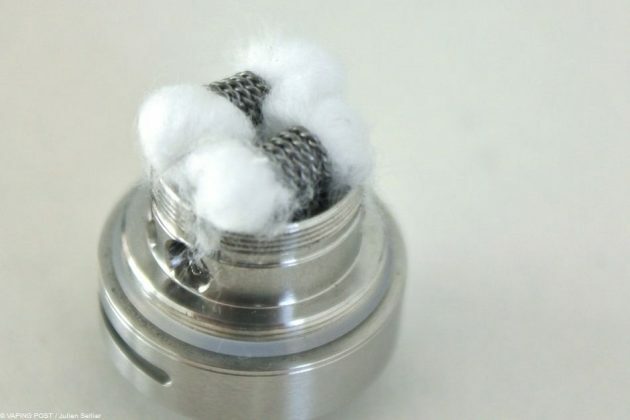 A last precaution will be to ensure that the airflow holes are free and the resistance coils high enough to allow a good circulation of air around the coils. 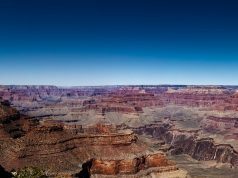 Postless built, how to proceed? Thank to the installation tool, mounting the coils on the base is very easy, even if it is much less intuitive than with a velocity-type one. 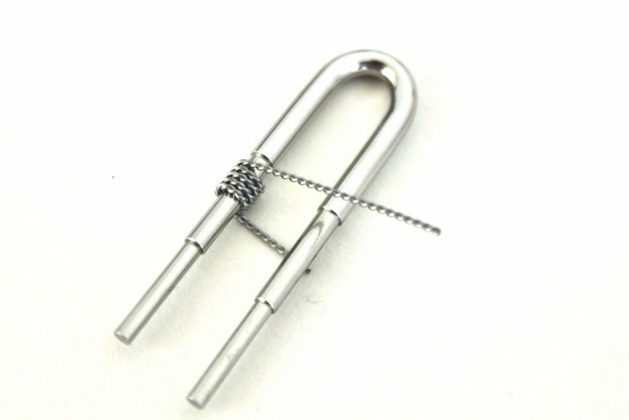 Once your coils are built, just insert them in one arm of the tool and cut the legs at the height of the opposite arm. A useful tool that you should not forget, never. Compared to the Serpent Mini, flat screws, stronger, have replaced the Allen screws to secure the resistance’s legs. Well done! With the included coils, the resistance is averages 0.2 Ω. Hence, a powerful box is needed to vape in this configuration. 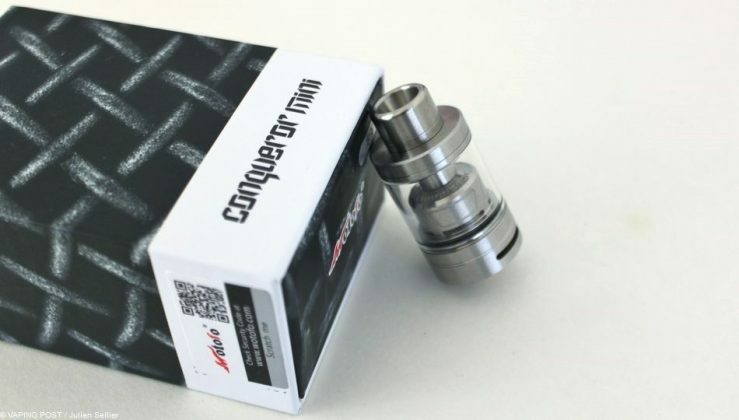 At least 40 W are needed so that the Conqueror Mini develops its full potential. The Conqueror Mini is a top-filling atomizer, the operation is achieved by unscrewing the top cap. 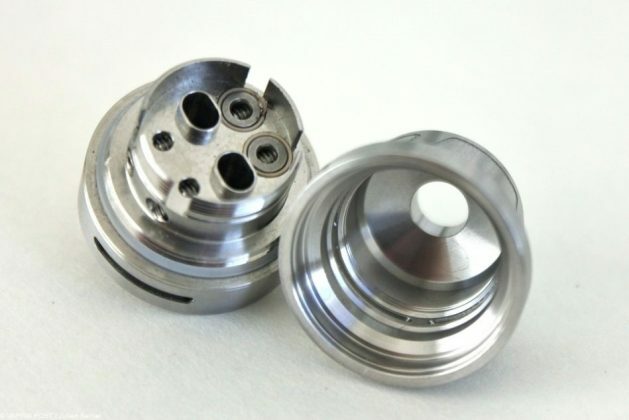 Take care to hold the body of the atomizer during the operation to prevent it from rotating and falling down. As usual with this type of atomizer, close the airflow holes to avoid any leakage. Perhaps surprisingly, the e-liquid inlets are not adjustable and cannot be fully closed, which is not an issue a priori. 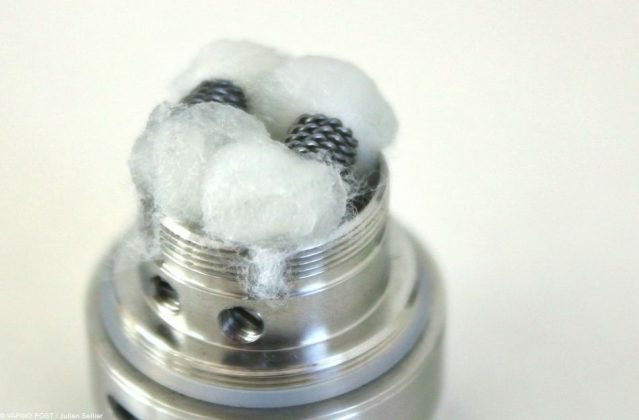 The atomizer works well like this. The drip-tip is identical to the Serpent Mini and this is not an asset. Too short, too wide, it is not pleasant to use. Moreover, it becomes hot in chain puffing. 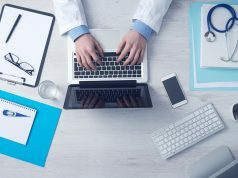 The best solution is to choose one in Delrin to avoid such issue. The finish of the Conqueror Mini is rather good. 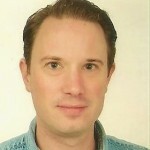 Threads are of an overall good quality, and it looks robust. Some screws might however pose problems on the medium term. The airflow ring is rotating freely and remains in the right position. 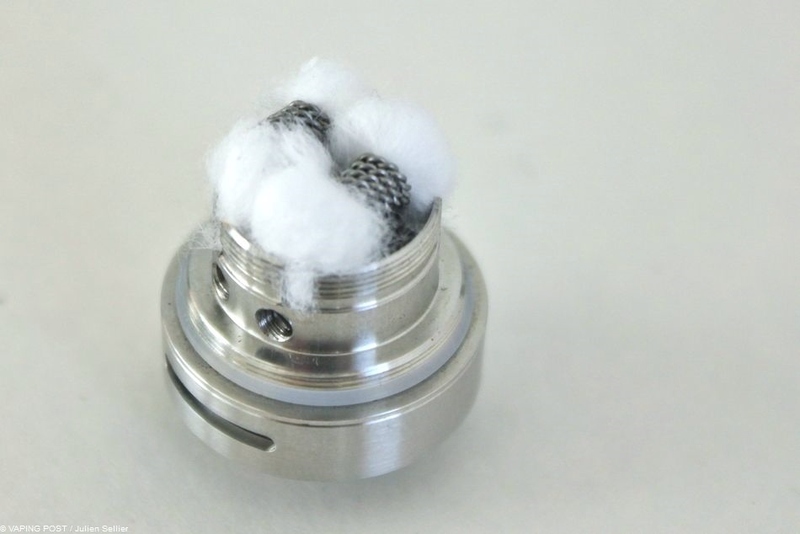 With wider airflow holes than the Serpent Mini, the Conqueror Mini is more aerial. 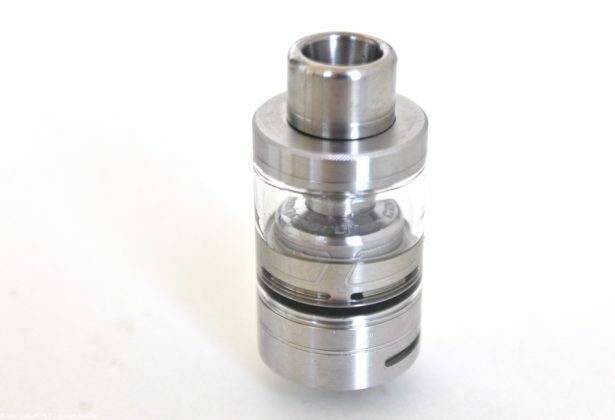 Its reduced atomizing chamber and the dome that it bears confer to the atomizer a good capacity to restitute flavors. 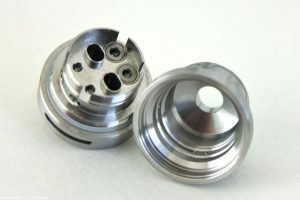 It can either be used in DL inhalation or in MTL vaping, when reducing the airflow but the vapor with be warm to hot. 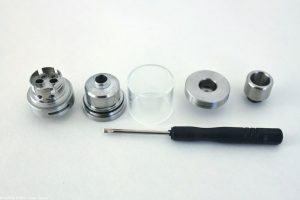 I tested the atomizer with a 0.46 Ω mount in SS316L at 30 W and an airflow set to three quarters. The result was even better in DL inhalation. The vapor was dense and its taste very good although a light wistling caused by the airflow. 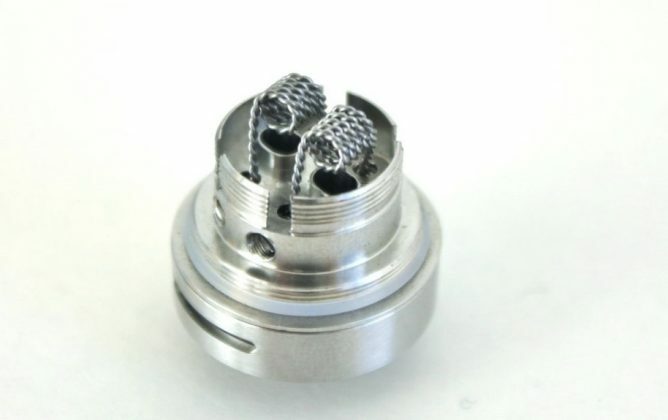 The base accepts thick wires like Clapton ones but it might be the upper limit because of the limited size of the atomizing chamber that is quickly saturated with a vapor whose temperature raises with puffs. Rating of 4.5/5. 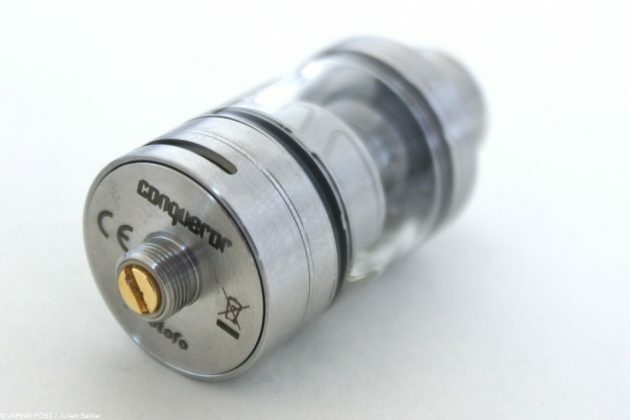 The vape quality offered by Wotofo’s Conqueror Mini RTA is its best asset. 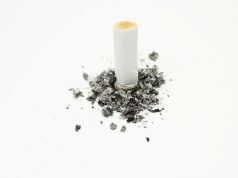 Well finished, well equipped, the rendering of flavors is also very good in a very dense vapor. It is intended for use by experimented vapers who prefer DL inhalation. It is a good choice if you have a powerful electronic box of at least 50 W maximum output. 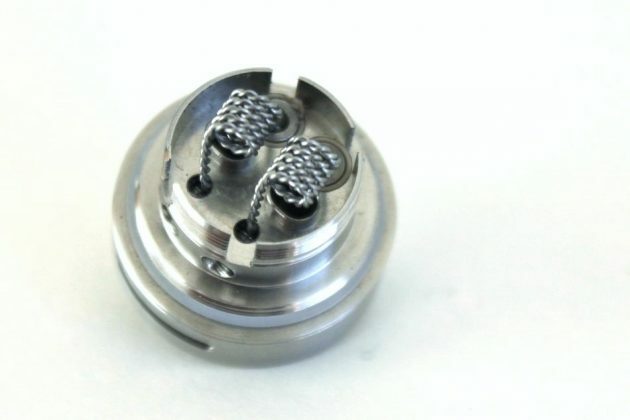 I am not sure whether postless decks have a promising future, this one needs a learning period but onces you get used to, it is rather simple to mount in dual coil configuration. Moreover, when mounted with care, it doesn’t leak and only seeps a little bit. And this for a very affordable price (around $30). The vaping quality offered by Wotofo's Conqueror Mini RTA is its best asset. Well finished, well equipped, the rendering of flavors is also very good in a very dense vapor. It is intended for use by experimented vapers who prefer DL inhalation. 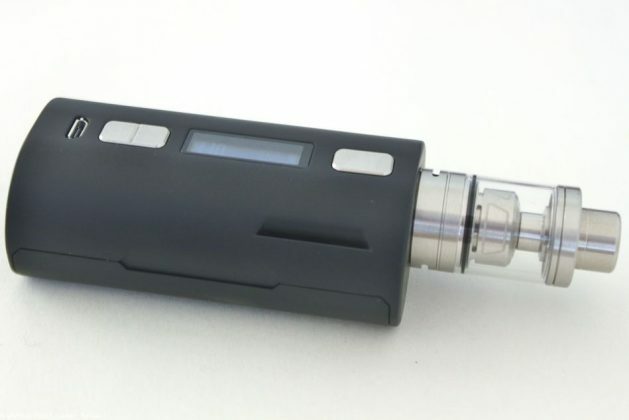 It is a good choice if you have a powerful electronic box of at least 50 W maximum output. I am not sure whether Postless bases have a promising future, this one needs a learning period but onces you get used to, it is rather simple to mount in dual coil configuration. Moreover, when mounted with care, it doesn't leak and only seeps a little bit. And this for a very affordable price (around $30).